Beautiful glass lantern with LED Candle the has a soft flicker glow! Candle also has a 5 hour timer switch besides the on/off. 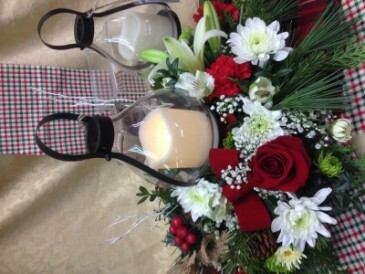 This genuine gift is nestled amongst a wonderful winter flower centerpiece. The perfect gift for your special loved one that will be cherished for years to come. Apologies for the sideways picture ~ tried everything to fix it! Your piece is guaranteed to be delivered right face up!